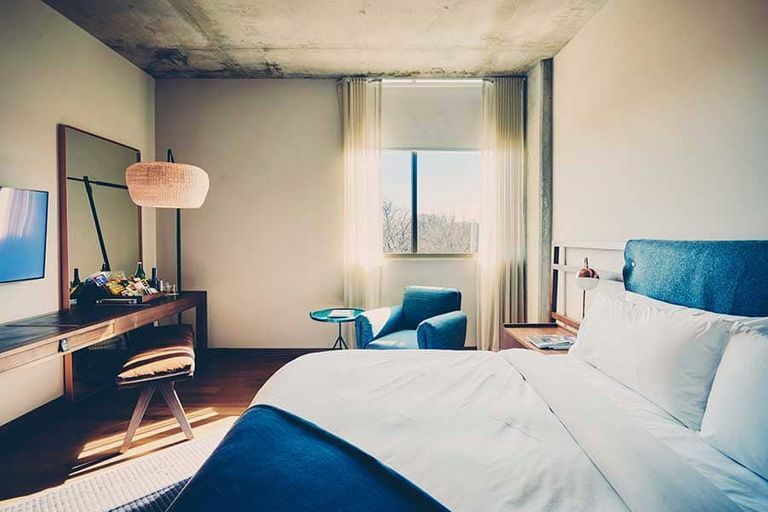 We offer 71 guest rooms, 10 suites, and 2 premier suites with views of South Congress Avenue and historic Travis Heights. Explore our classic guest room types below. Our River City rooms offer peaceful views of the hotel’s interior courtyard and greenscape, where you’ll also find coffee shop gem Mañana. Enjoy bespoke Matteo bed linens, a locally sourced minibar, and a large walk-in shower that features a rainfall showerhead and C.O. Bigelow bath & body products. Lounge in our custom Finery LA bathrobes while you stream content using your dedicated Wi-Fi network and in-room Apple TV & Google Chromecast. Get exclusive streaming access to 40+ Drafthouse Films, a production company based right here in Austin, Texas. Our Heights rooms offer scenic views of Austin’s historic Travis Heights neighborhood, established in 1912. 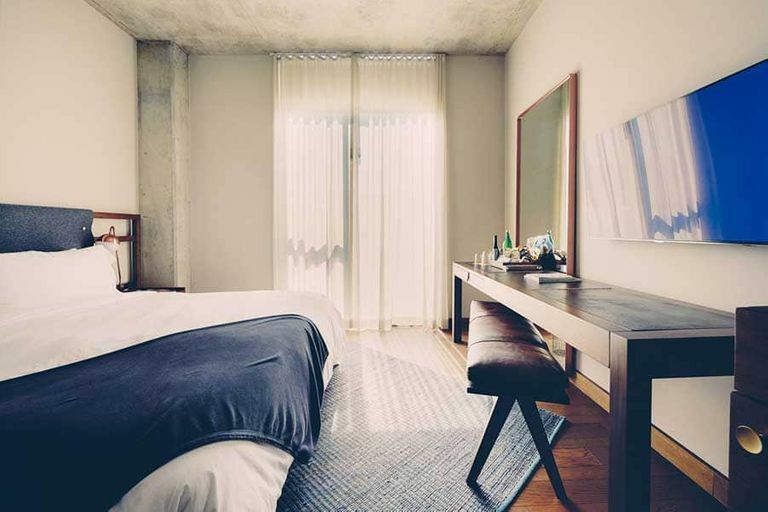 Tucked away from the street, Heights rooms are quiet retreats, complete with bespoke Matteo bed linens, a locally sourced minibar, and a large walk-in shower that features a rainfall showerhead and C.O. Bigelow bath & body products. Enjoy easy access to our 24-hour fitness center and rooftop pool & bar, where you can rosé all day. Traveling for work? The Lobby Bar offers comfy seating, free Wi-Fi, and an all-day coffee & snack menu from neighboring Café No Sé. 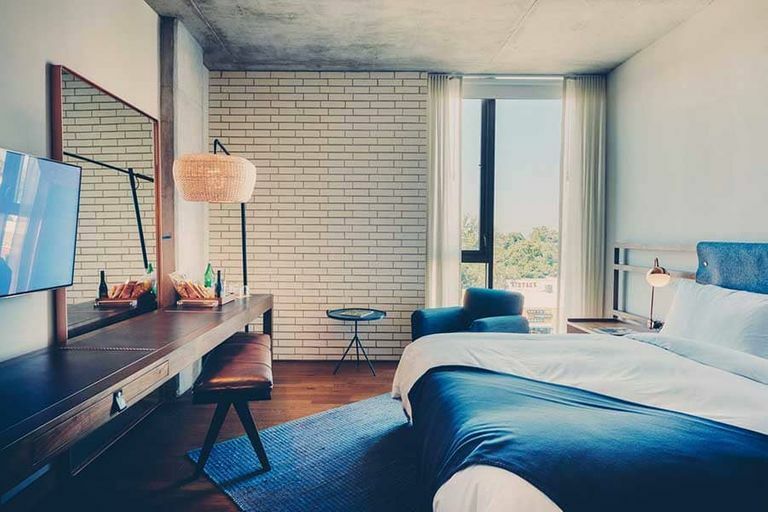 Our Bouldin rooms overlook vibrant South Congress Avenue, home to our favorite local shops, restaurants, and music venues. In-room, enjoy bespoke Matteo bed linens, a locally sourced minibar, and a spa-like walk-in shower with C.O. Bigelow bath & body products. Opt to put on one of our custom Finery LA robes and hide out—we offer a complimentary dedicated Wi-Fi network and in-room Apple TVs & Google Chromecasts.